As a fan of musical theatre classics, this upcoming season for Mirvish is going to be an exciting one as they’re bringing back classics like Phantom of the Opera and Chicago to the Toronto stage. Currently, Tony Award-winning choreographer Christopher Wheeldon, along with playwright Craig Lucas, have brought An American in Paris to the Princess of Wales Theatre, dazzling audiences with timeless songs by George and Ira Gershwin along with and dance numbers that will surely leave you in awe. An American in Paris takes place in Paris, France just after the end of World War II. Though the Nazis have been defeated, France is still reeling from their presence and in need of merriment. What better time to debut a new ballet. The story revolves around a young budding ballerina Lise Dassin (Allison Walsh) who just so happens to capture the attention of everyone around her. Jerry Mulligan (McGee Maddox), an American GI, aspiring painter, and one who just won’t take no for an answer; Adam Hochberg (Matthew Scott), Mulligan’s best friend and composer for the ballet; and Henri Baurel (Ben Michael), engaged to Lise after his family cared for her during the war. Though Lise’s heart yearns for Mulligan, duty and obligation bind her to Henri. In addition, as Wheeldon is, first and foremost, a ballet choreographer, his direction of An American in Paris definitely has a very strong dance presence — though not just with ballet. What this ultimately means is a good portion of this story is told through movement, not just through song and dialogue. To start with, this production is absolutely visually beautiful. The stage design and costumes by Bob Crowley, lighting by Natasha Katz, projection design by 59 Productions, the seamless transitions of the set pieces, the sound by Jon Weston and music by Todd Ellison–all of it is just gorgeous across the board. This show is one of the most sumptuous pieces of theatre I’ve seen in a long time. However, my emotions for An American in Paris happen to be mixed. I don’t have a background in dance, and my knowledge of dance is very minimal. Not that a background in dance is required to enjoy this show, but I found that it did limit mine. I prefer my musical theatre to place its focus on the music and acting, which is not the case here. The opening sequence here is not a song and dance number that usually opens your standard musical, it’s a gorgeously crafted and choreographed dance number illustrating the turmoil France endured leading up to this moment. A sign that the majority of the storytelling here will be told through dance. The dance is sublimely beautiful, no doubt about that. It’s mesmerizing to watch and all too easy to get lost in the emotions and poetry of the movements. But unfortunately, both my guest for the evening, Lin, and I found that we were losing the characters in the dance. Particularly in the first act, as much as we loved the beauty of the dance, we couldn’t find ourselves connecting with Lise on an emotional level. What does she really want? At first she resists Mulligan at every turn, with him playing the insufferable American who fails to relent and let be, and yet she gives in to him in one song. I wanted more from these characters that I just wasn’t seeing in the dance. In driving this story forward to ultimately get to the rather predictable climax — as how else can a story of three men in love with one woman truly end? — I was hoping that more plot points would arise along the way. Aside from the pitfalls of putting together the ballet and Mulligan being seduced and lured by Milo Davenport (Kirsten Scott) promising him stardom for his art, I found many of these points got lost in elaborate dance numbers during the first act. I did like how the second act rounded out the story and closed off many of the questions left open in the first act — in particular with an eye-opening scene that took place back stage at the jazz club. I found the scenes and musical numbers more engaging in the second act, though Lin said she didn’t feel as connected in the end. The final pas de deux during the ballet was stunning to watch. Overall, despite not hitting all the theatrical and musical notes I had hoped for, I still enjoyed seeing An American in Paris, if just for the beauty of the whole production, and the chance to get lost in the dance and the old Broadway glitz. Perhaps you’ll get more out of this than we did. Either way, there’s no denying the inherent beauty of this show, it’s worth a night out. 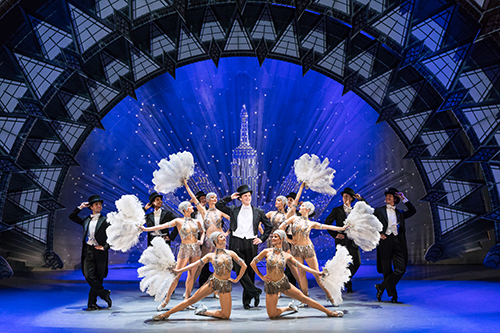 An American in Paris is playing at the Princess of Wales Theatre (300 King St W) until April 29, 2018. Performances run Tuesdays to Saturdays at 8:00 pm with Wednesday matinees at 1:30 pm and weekend matinees at 2:00 pm. Tickets range from $65 to $150. Group rates are available for groups of 15 or more, call 416 593 4142 for details. Tickets can be purchased online, by phone by calling 416 872 1212, or in person at the box office. Run Time: 2 hours 35 minutes with intermission. Audience Advisory: Use of theatrical haze. Recommended for ages 10+. Photo of the touring company by Matthew Murphy. It’s pretty irresponsible to ignore one fact about the Toronto production of An American in Paris — the male lead, McGee Maddox, was a principle dancer with the National Ballet of Canada prior to embarking on this new phase of his career. Ignore this information would be akin to reviewing the film and ignoring Gene Kelly’s immense contribution to it. One of the worse shows I’ve seen. We left at intermission. The two leads are weak singers. And the dance numbers were incessant and repetitive. A third of the audience left at the same time as us so obviously we were not alone in our thinking. And while he may have been a wonderful danseur, h was all wrong for this show.